November, for me, will be taken up by large amounts of tea and black coffee, not much sleep, staring at a blank word document, followed by intense sessions of furious typing, a lot of foot tapping, walking, and furious note scribbling. All in my attempt to write 50,000 words by midnight on November 30th. 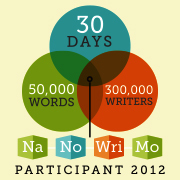 I will be taking part in NaNoWriMo, you see. November is National Novel Writing Month. I have been trying desperately to prepare for it because this is my second attempt at the challenge. My first attempt ended up in 26,000 words (not bad really) of poorly written science fiction. I went into it blind, and suffered. I am not a writer, and doubt that I will ever declare that I am one. I find it incredibly difficult to express myself in word-form, and I lack passion. I think, that’s what I do. Putting it on to paper is a whole other level. It feels permanent and exposed and I feel, well, vulnerable. The difficulty is part of why I try, though. I have a ridiculous amount of admiration for people like my sister, who if she’s anything, she’s a writer. She enjoys it. She can’t not write. From an early age we had her poetry and writings up on our fridge, on the walls (sometimes literally written on the walls…) – deep and well thought out philosophies, clearly expressed. I don’t know how to prepare for a month of writing every spare moment. It’s like knowing you are going to a buffet meal tomorrow. Do you starve yourself so you have an appetite? Or do you build yourself up to it like a marathon runner, eating a little more and a little more until you are sure your stomach will cope with all that damn well already paid for food? Like a long car journey – you are going to be sat down for a while, so to prepare for it do you… stand up? Will I get fed up of all the writing? Should I… read books and write in preparation.. or not? I’ve decided to try and create some sort of premise for my novel… an outline of some sort because, well, because of the disaster of last time, and because yes, it does make a lot of sense to do so – I don’t really know how I thought I would create something meaningful last time without an actual plot. I’ve also started re-reading one of my favourite books, by Banana Yoshimoto – Kitchen. I am still unsure if reading a book that I love so much is a good idea however. Will what I write ever compare to it?! Is it going to make my writing feel totally inadequate from the start? Or will it give me inspiration? Ultimately, I don’t have a clue how things will go until I start writing. I know it will go up and down, but I don’t know when, why and for how long. Woops I haven’t written a post in an awfully long time. Sometimes life just runs away with me. I have no idea what I’ve been doing in the time to be honest. Working and sleeping mostly. Life can get kind of mundane sometimes, even in Bangkok. Come to think of it, I have moved apartments, which I suppose is a pretty major event. Just over a year ago I found a cosy apartment on Sukhumvit Road, and moved in with 1 suitcase, and 1 back pack. Moving out I used 3 suitcases, 3 backpacks, and numerous other plastic bags of bits and pieces. I’ve collected a lot of ‘stuff’. Oh stuff. How I wish I didn’t need you, yet I always seem to want more of you. I suppose it’s not too bad, though. Most of my acquired ‘stuff’ is books, bottles of wine… fairy lights, water guns and orchids. November is fast approaching, and I’ve been reflecting on how much I miss autumn – even though as my friends and family in England point out to me ‘it’s cold!!’. But I miss the (ok I think this is pretty clichéd …) colours of the leaves and stuff. Plus I get to wrap up in a coat and scarf and drink gingerbread lattes and think of Christmas. And make apple crumble. And I make a ruddy good apple crumble. The main thing I miss is the sea. Living in Brighton, the seafront was my thinking spot. I often paced up and down, sometimes walking vast stretches, emptier – apart from the odd runner – with the onslaught of winter approaching. The waves’ mood became unpredictable, changing day by day from calm and pleasant with reflections of cobalt and an amber sun, to heavy and crashing, the colour of a dull, mottled sky. I often associate music with memories, and ‘Foals’ is my music of choice for this one, specifically ‘Total life Forever‘. It helps me recreate narrow streets and very steep hills, crunchy orange leaves on the ground against a backdrop of white terraced houses, pebbles, seagulls, and relinquishing the achingly long days of summer sun. In Thailand, people look forward to less rain, less humidity, slightly cooler weather, and clear blue cloudless skies. It’s refreshing, and weather I look forward to immensely. Inevitably though, I will be caught wistfully thinking of gloved hands and cold noses, being given hot cups of tea by friends, wearing fluffy socks and going inside because it’s warmer, not cooler.